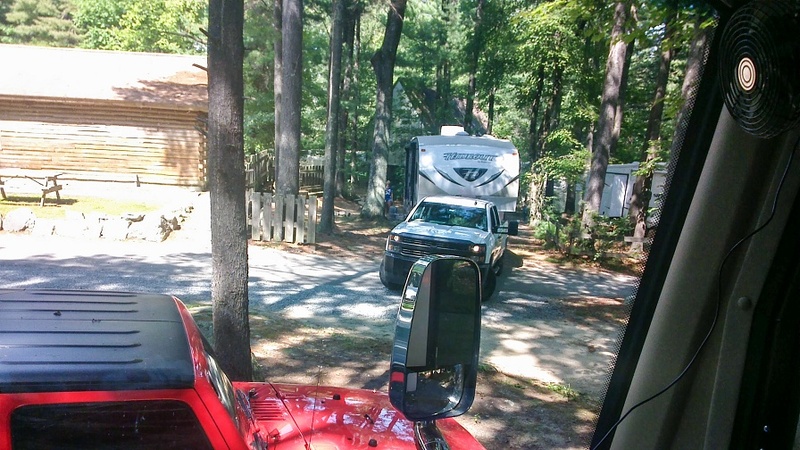 We have been in Boston/Minuteman Campground for three weeks and will be here until about the first of October. One of our longer stays visiting our oldest son and his family. 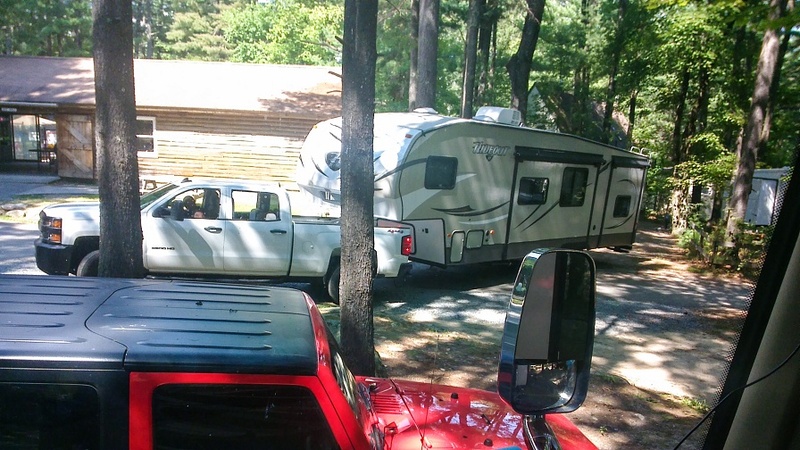 We observe A LOT of comings and goings of folks camping here. Some stay for a few days, some just over night, but because Massachusetts has so few campgrounds the traffic in and out of this RV park is constant, especially at this time of the summer season. 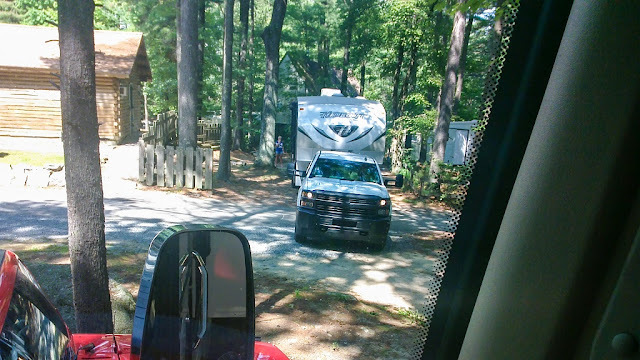 For those of you who are not RVers it is difficult to describe in words the activity of transferring your house from one point to another. Its practice brings with it its own particular level of anxieties which diminish somewhat with practice but really never subside completely. 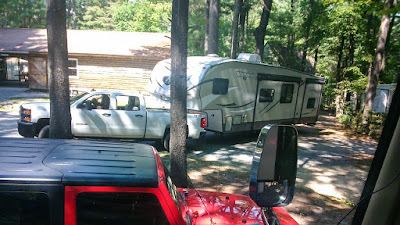 Perhaps the height of anxiety comes when you have to maneuver into a new site in an unfamiliar campground. I have written about a few of ours in past postings. No matter how many times you have accomplished this, it never becomes mundane. 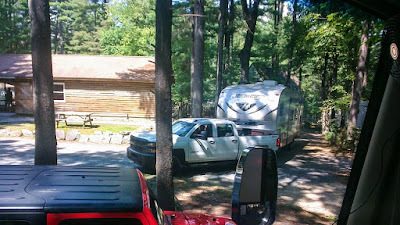 Our current site is a back-in and was not too difficult because its location in the campground afforded some decent maneuvering room. We disconnected Hope and Joanie was outside the rig guiding me backwards. Beside our big side mirrors, our back-up camera is very useful in times like this as it also has a microphone so that I can hear Joanie as well as see her signals. I am constantly turning my head from back-up monitor to left side mirror to right side mirror and it is easy to get a bit disoriented backing up after a long day of driving forward. Joanie had to remind me of my "left" vs. my "right" vocally while guiding me which brought a few chuckles from our neighbors. Which brings up the next topic in this discussion which is that in campgrounds this small and tight, you will have plenty of audience. 40 years ago when this campground was founded, camping was just that - camping, mostly in tents. Some folks had small trailers and pop-ups that they pulled behind the family car. Maneuvering them was not a significant source of anxiety. 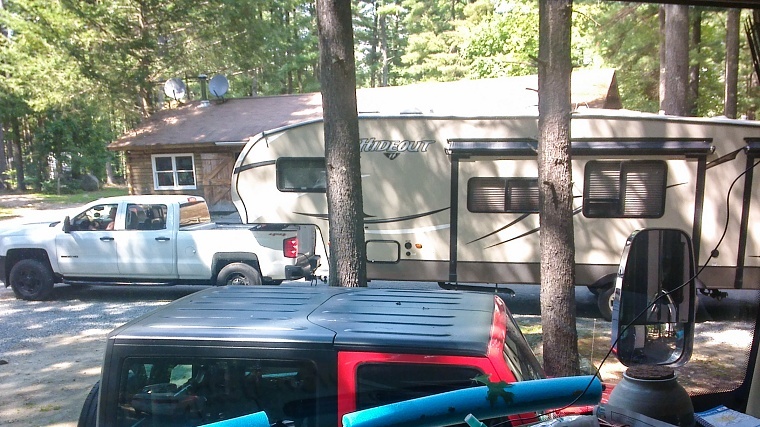 Since then RV's have grown considerably; from an 8 foot pop-up and a 16 foot travel trailer, they are now 2 and even 4 times that size trying to maneuver in the same tight little campground. With families trying to squeeze in the last of their summer vacation, the campground is almost full. 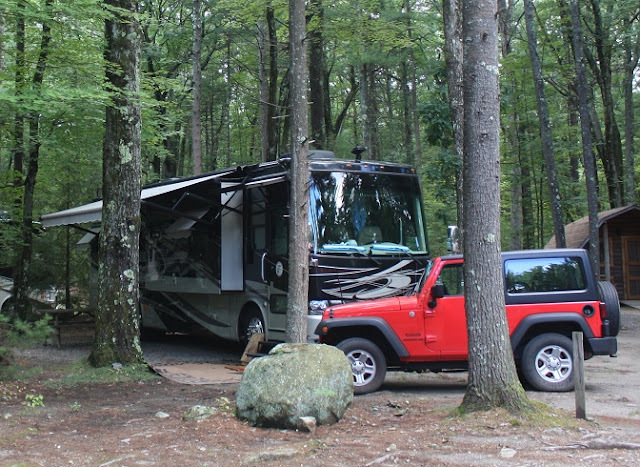 Last night a modest size "A" class motorhome came into this wooded campground in the dark, about 9 PM. The campsite they gave him was up a small dirt trail with a dead-end. With cars, tents and trailers on all sides there was little space to manipulate a rig that large. This required him to back down the trail to an area he could turn abound in and then BACK- UP the trail and into his assigned site. I think he may have had a couple helpers too many from all the yelling that was going on but he finally made it. 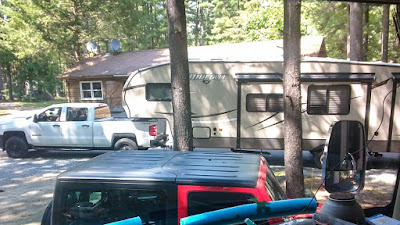 Last weekend, this 5th wheel spent the better part of a half hour parking in his back-in site. Back and forth he went trying to determine which way to turn the steering wheel that would point the trailer in the correct direction. 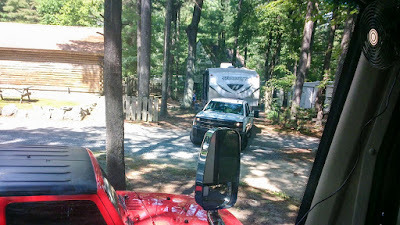 The best way to describe how to back a trailer is that you turn the steering wheel the WRONG way to start the trailer traveling the RIGHT way all the while remembering that all steering is OPPOSITE of the way you really want to go. You can see his DW just to left of the trailer in the back. She had a handy-talkie to vocally give directions and tell the driver how much clearance he had on his blind corner. It is hard to keep your skills sharp if you don't do this often.